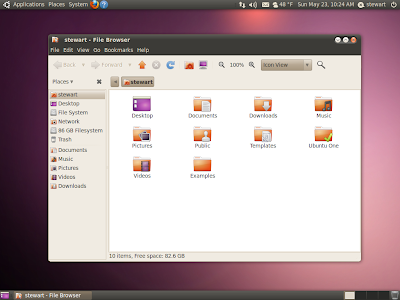 Why did Canonical designers decide to put the title bar buttons on the totally unusable position of the left hand side? I can bet you a pretty big part of it is because Canonical has hired a new design team to work on the new branding, and they happen to all be using the totally unusable Macintosh OS X. While I'm not going to go into the details of the usability issues with LHS buttons vs RHS buttons or the politics of Canonical using Mac's to design Ubuntu, what I will do is show you how to change them back to the "Correct" location on the right hand side. However, all of these methods will reset back to the left the instant you go clicking around in your appearance preferences. If you want to make it stick and be able to switch themes at any time you will need a new theme. You can either download a theme or create one yourself very easily. The video below will show you have to create a new RHS theme. Now you have the benefit of keeping the default theme but with the button layout changed, and you can switch between LHS, RHS or any other theme as you wish, without having to reset your tweaks or gconf keys each time you change your appearance settings, which for most people means finding your old bookmark or searching Google to find those confusing instructions again. If you are the type that would rather download the theme, I have made my customized theme available. As an added bonus, it also adds the application icon to the menu. At least those designers only job is the artwork. I would hate to see Gnome's Nautilus suffer to the lackluster usability of Apple's Finder.